Today, at Google I/O, Google revealed that the first Chrome OS laptops, or Chromebooks, will be available for order on June 15 in the United States. Prices will start at $349 for an 11.6-inch model. Additionally, Google announced a sweet deal for students -- a Chromebook for 20 bucks a month. Assuming a nine-month school year that works out to $180. Businesses can subscribe for $28 per user/a month. Chrome OS is a cloud-dependent operating system requiring a persistent Internet connection -- or so it seemed before today's Google I/O keynote. The user's Google account ID allows syncing of browser bookmarks and passwords with computers running Chrome and opens access to server-side Google services like Apps, Gmail and Reader. Today Google revealed some new enhancements -- a file manager and media player for Chrome OS, which allow users to access some local files. Additionally, at launch, Chromebooks will be able to access Gmail, Google Calendar and Google Docs offline. Google also is providing developers with the means of associating cloud services with Chrome OS for offline use. Angry Birds, which debuted today at the Chrome App Store, supports this capability. 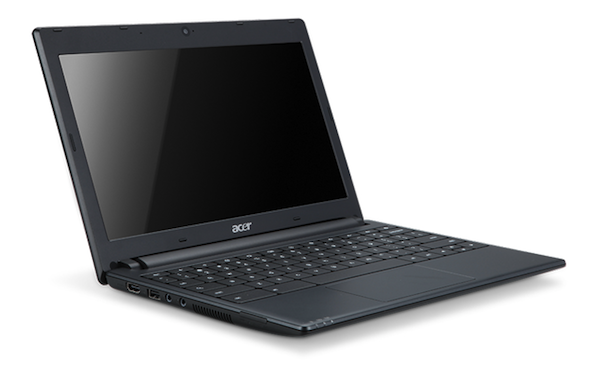 Acer and Samsung will be the first manufacturers selling Chromebooks, starting June 15. The Chrome OS laptops will be available from Amazon and Best Buy in the United States. They also will be available in six European countries -- France, Germany, Italy, Netherlands, Spain and United Kingdom. The Samsung Chromebook will have 12.1-inch display and 8-hour battery life. It will be available in WiFi-only and WiFi/3G versions for $429 and $499, respectively. The Acer model will have an 11.6-inch display, starting at $349. Could this be the MacBook Air killer? 2.95 lbs. | 1.34 kg. Besides direct sales, Google will offer subscription programs for businesses and schools, something more commonly seen for software than hardware. Student subscriptions will cost $20 per month, while businesses can get a Chromebook for $28 per user per month. Google' business subscription program has some hugely appealing attributes. The search and information giant will provide a Web console so that IT organizations can centrally manage the devices. Google also will provide warranty and replacement services -- and, get this, hardware upgrade replacements. Since users' files and settings are synced to the cloud, upgrades would be hugely simplified. Swap and sync. 1. Most campuses have ubiquitous WiFi, so cloud connectivity shouldn't be a problem. A cloud computer is best used with constant connection to the Internet. 2. Younger consumers are more likely to be Google users. For example, the kids at my daughter's high school primarily use Google Docs for assignments, particularly those where they collaborate. Irony: The school received an endowment from the Bill and Melinda Gates Foundation seven years ago. 3. College students (and even high schoolers) presumably would be more flexible trying something new. 4. Lock `em in young is a tried-and-proven marketing approach, that's why student software is so cheap. Companies like Adobe and Microsoft understand that if people use something and get accustomed to it in high school or college, they're likely to stick with it. 5. Chromebooks should have some cool factor -- for being geek and different from Macs (or Windows laptops). PCs are so yesterday, while Google's cloud computer is so tomorrow. 6. This week, Google introduced YouTube movie rentals and music streaming from the cloud. But that's more a benefit to students who also have Android phones. Google unveiled the first Chrome OS laptop, the Cr-48 in December 2010, as part of a 60,000 unit trial. Today Google revealed that it had received 1 million applications for the Cr-48 pilot program. Fifty thousand businesses also applied. "A week with Google's Chrome OS laptop, Day 1: Getting acquainted"
"A week with Google's Chrome OS laptop, Day 2: Becoming a cloud citizen"
"A week with Google's Chrome OS laptop, Day 3: Living with Flash"
"A week with Google's Chrome OS laptop, Day 4: Who is the cloud for?" "A week with Google's Chrome OS laptop, Day 5: My life in the cloud"
"A week with Google's Chrome OS laptop, Day 6: Adopting a new lifestyle"
"A week with Google's Chrome OS laptop, Day 7: Settling in for the long haul"
But my forced real-world test, after my 11.6-inch MacBook Air fatally crashed in March 2011, proved to more enlightening. Chrome OS has huge potential, although it's hard to fathom why Google needs yet another operating system. Sure Ice Cream Sandwich promises to unite Android for smartphones, tablets and embedded devices, but, c`mon, one operating system should be enough for all devices. More broadly, there is the question: What will Google's Chrome OS notebook mean for Apple and other PC makers for which high schools, colleges and their students or teachers are a big market? One of my daughter's high school classes distributes netbooks, which could just as easily be cloud computers. Google has something to offer the budget minded here. Then there is the business question. Particularly for small businesses, $28 a month is an easily quantifiable fee that includes cloud service, hardware and software as well as support and free upgrades. Betanews readers who are students or parents of them, would you take the Chrome OS laptop subscription over a more traditional laptop? To IT managers I ask: Would you deploy Chromebooks either purchased or for monthly subscription? Please respond in comments. Editor's Note: Acer price corrected; $349, not $399.